Stack Exchange is about questions with objective, factual answers. We expect answers to be supported by facts, references, or specific expertise, but this question will likely solicit debate, arguments, polling, or extended discussion. The message is quite clear: objective good, subjective bad. But then there’s the voting. Stack Overflow is built on a voting system used to separate the wheat from the chaff as well as rewarding contributions that others judge valuable. Voting on answers to objective questions doesn’t make much sense, though. If a question’s actually objective, then any answer is either right or wrong. There’ll be non-trivial differences in terms of legibility, comprehensiveness, and style, but you don’t need the wisdom of the masses to judge which answer’s written best; you want their help telling you which answers are right. 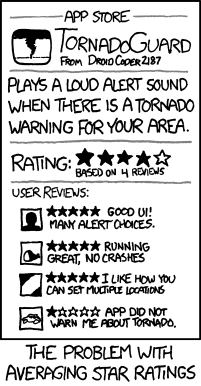 By conflating voting based on objective correctness and explanatory quality there’s a risk of falling into the trap of xkcd’s TornadoGuard app: A well-written wrong answer to a question about a problem that’s not so common as to make correct responses readily identifiable by the group might well get more votes than a terse but correct answer. Fundamentally, voting is used to answer subjective questions. If there were unassailable objective criteria for choosing politicians, we wouldn’t need to bother with elections. We do bother with them because the issue isn’t objective. Programming has far fewer subjective questions. If I ask “Why is this code producing this error?” there’s generally a single fundamentally correct answer.